Welcome to FreshBooks! As a newly invited Basic Employee, we know your first priority is getting up and running quickly, so we've prepared this guide that shows you exactly what you need to know and do. As a Basic Employee, you can help your employer by tracking time and expenses, and working on Projects you're invited to. 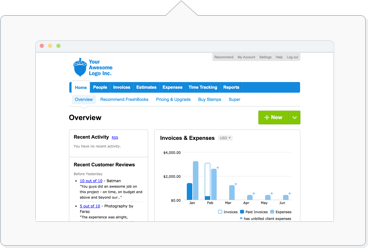 FreshBooks, if you're not familiar with it already, is an online invoicing service that helps freelancers and small business owners save time, get paid faster and look really professional. You’ll easily keep track of time and expenses, as well as collaborate with other team members on shared Projects. Click on Save My Profile to finish. You’ll only be able to see your own time entries and expenses.